*Percent of Total Appropriations and Income Fund for each budgetary unit for the fiscal year. Stop gap SB2047 was used in FY16 and therefore is reflected in the 2016 figures. As of 4/19/2017, the General Assembly has not enacted any additional appropriations for FY17. During FY16, the General Assembly enacted two stop gap appropriations (SB2059 and SB2047). The first provided about 31% of the prior year's appropriation. The second bill, passed on June 30, 2016, provided funding totaling almost $75 million that may be used in either FY16 or FY17. SIU is using the second stop gap appropriation to fund FY16 expenses. 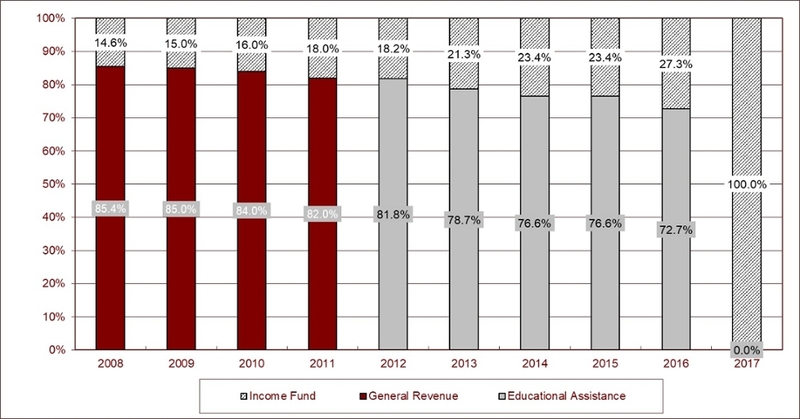 General Revenue Funds (GR) are those funds established to receive the major portion of tax revenues and to pay the regular operating and administrative expenses of State agencies. 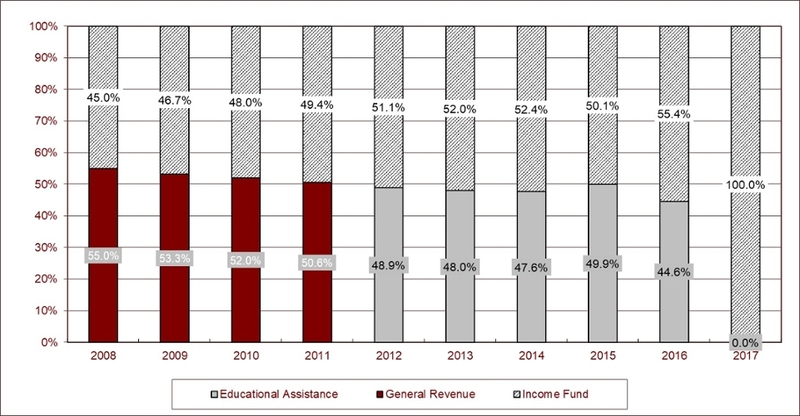 Educational Assistance Fund (EAF) is a "Special State Fund" established July 1, 1989 by the Illinois Income Tax Act. This act establishes that a portion of the state income tax be provided as financial assistance to Elementary, Secondary, and Higher Education in the State of Illinois. University Income Funds (IF) are those funds which receive revenues such as course-specific fees and tuition at State-supported institutions of higher education. These funds are appropriated for the support, operation and improvement of State-supported colleges and universities. University-Wide Services are those operations provided centrally that function for the entire University system as opposed to one specific unit. Fund source definitions are from Comptroller's Uniform Statewide Accounting System (Procedure 09.10.20). Awards are distributed between colleges according to percentage of effort reported to the Office of Sponsored Projects Administration (OSPA). Due to rounding in distribution calculations, sums of columns may not match totals. SOURCE: SIUC Office of Sponsored Projects Administration.